Cairo (AFP) - Czech archaeologists have unearthed an ancient funerary boat near the Abusir pyramids south of Cairo, officials said Monday, in a discovery that could shed light on shipbuilding in ancient Egypt. The discovery of the more than 4,500-year-old remains of the wooden vessel, which archaeologists believe belonged to a prominent member of society, was made at the Abusir South cemetery, an antiquities ministry statement said. 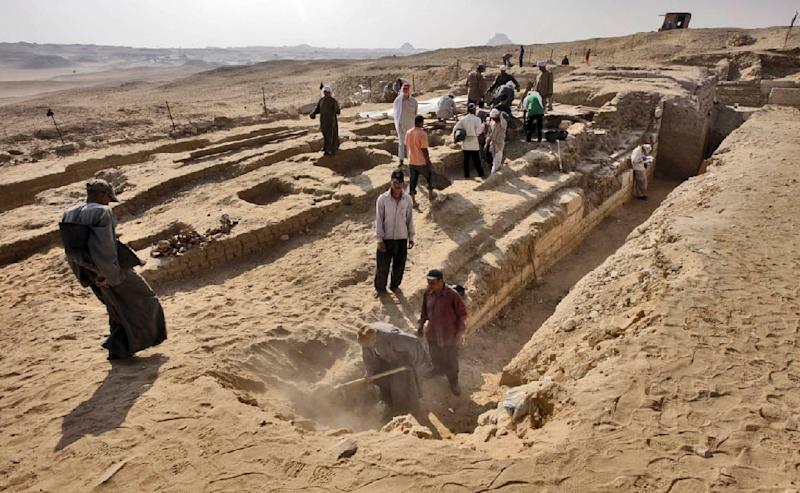 While members of the team were clearing a mastaba or ancient tomb, they found parts of the 18-metre-long (59-foot) boat covered in sand and lying on a bed of stones, the ministry said. "This is a highly unusual discovery since boats of such a size and construction were during this period reserved solely for top members of the society, who usually belonged to the royal family," the director of the Czech mission said in the statement. The remains were found buried near the mastaba's southern wall, indicating the "extraordinary social position of the owner of the tomb", Miroslav Barta said. The boat's length and pottery found with it shows that it could be from the end of the third or beginning of the fourth dynasty, the ministry said. "The wooden planks were joined by wooden pegs that are still visible in their original position. Extraordinarily, the desert sand has preserved the plant fibre battens which covered the planking seams," it said. "It is by all means a remarkable discovery," Barta said. "The careful excavation and recording of the Abusir boat will make a considerable contribution to our understanding of ancient Egyptian watercraft and their place in funerary cult."